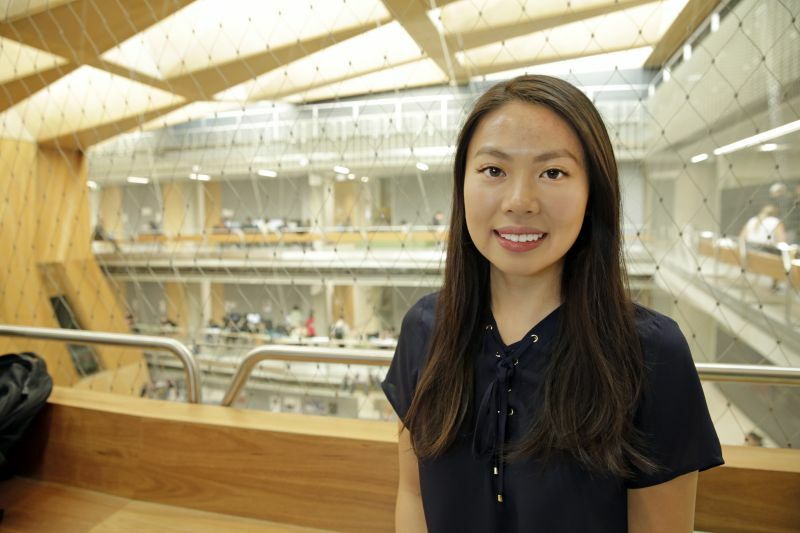 Sarah Chan majored in architecture in her undergraduate degree, but decided to change her focus to construction for her graduate studies. We caught up with her to find out about her experiences as a Master of Construction Management student so far, and to learn any advice she has for anyone thinking about studying at the Melbourne School of Design. What made you decide to pursue a Master of Construction Management? I was motivated to study a Master of Construction Management because I believe it challenges my way of thinking about building and structures, and I want to have the ability to influence the built environment. My passion is to work towards generating a better future and to create a positive outcome, not only for the city of Melbourne but beyond. A particular building that inspires me, and which I believe has made a positive difference to its city, is the Marina Bay Sands in Singapore. Its complex and unique design including the famous infinity pool on top is a remarkable sight to see. It is one of Singapore’s icons, and has encouraged a lot of positive interest in the city. How has your undergraduate degree shaped your experience in graduate studies? I studied a Bachelor of Environments and majored in Architecture. My undergraduate degree enabled me to develop an understanding of construction processes and the cycle of management that works collaboratively with the building design component. Within this Master’s program, I have been able to utilise and draw on both the construction and architectural knowledge that I learnt in my bachelor’s degree. So far, what are the most valuable skills that you have learnt? Communication is definitely one of them. When there are group assignments, it is vital that we can convey information so that everyone can understand, which ensures productivity and that we can operate effectively. Being resilient is also an important skill I have learnt which pushes me to keep trying even after failing to do something the first time. Skills like these can be transferred to work places which is why I believe they are so valuable. I would definitely advise students to participate in extracurricular activities within the university. There is a range of clubs that you can join, from interest groups to course related ones. This allows you to meet new people and friends during your time at the Melbourne School of Design. During my first year of my Master degree, I joined a student club called Construction Students Association (CSA). This enabled me to connect not only with students but also with people in the industry. I was responsible for organising various events with my fellow committee members that offered us opportunities to network and interact with a range of people in our social and professional events throughout the year. One of the main events is Industry Night, where we invite companies from the construction industry to talk to students about their experiences and to network with students. You work part time in the industry at PDS Group. How you are finding juggling work and studies at the same time? Sometimes it can be a bit difficult, but I try my best to balance my study, work and social life. What I usually do is make a study plan and ensure I am aware of when my assignments are due throughout the semester and know what to prioritise and understand what I can realistically handle for the week. Organisational skills are also essential, so keeping a calendar and writing down all my plans for work, study and social events have helped me hugely; I allocate time for them every week. This might mean sacrificing some free time occasionally, but I try to be as productive as possible. How do your studies help you with your day to day work, and how does your work in turn help you with your studies? I have found working in the industry whilst studying very beneficial. I can incorporate the knowledge I gained from my lectures and assignments into my work at PDS Group. For example, my project manager asked me to find some very specific information in a contract. I found it really quickly, because of a subject I took in my first year, ‘Contract Management’. It helped me to understand how and where to look for specific information in contracts and, at the time, I was enrolled in the subject ‘Construction Law’ which also helped me to understand the terminology used in the contract. Working has also assisted me with understanding new or specific topics during the semester as I get hands on experience at my workplace which makes me feel more confident and have a better understanding of certain topics. What are you planning to do when you have completed your studies? I hope to find job opportunities where I can further develop my skills in the industry. I want to be able to bring everything that I have learnt throughout my time at Melbourne School of Design into my career. From my experienced so far, I am confident that this program will assist me to become job ready. Melbourne consistently ranks highly amongst Universities in Australia and the region. How important is it for you to graduate with a degree from a world standard university? It is important for me to graduate from one of the highest ranked universities because it is recognised not only within Australia but overseas too. It may give me an advantage if I decide to work overseas as employers will be aware of the university’s reputation which offers me more opportunities.